Home » WOD Blog » What’s your SWOLF Score? Notes: Lateral box jumps should be performed with both feet touching top of the box. Conditioning Bias may sub situps or V-ups for Toes to bar. 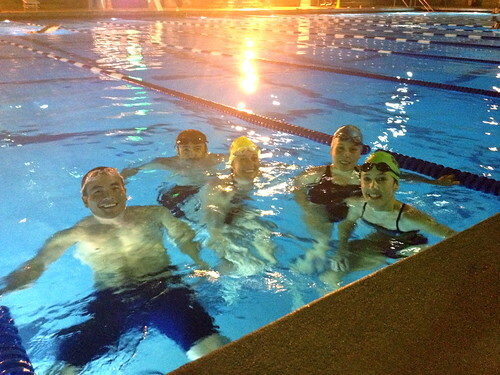 Last night was the first Swim Night for PCF and another huge step for our developing Endurance program. We now have a lane reserved every Thursday night from 7:30-8:30pm at the Culver City Plunge. You don’t need to pay to enter the pool, just tell the front desk you are there for Crossfit. Try to show up ten or fifteen minutes early so you can perform DROM and shoulder mobility on deck to get as much pool time as possible. I’ll be there ready with bands and foam rollers to help you out. The class will be similar to Track Night and regular Crossfit classes: Warmup, Skill Work (see below), WOD, and then a Cool Down that will probably include some kicking and/or pulling. Swimming can be monotonous and boring at times, but last night reminded me how much easier and more fun it is when you do it with your teammates! If you have any questions about attending please drop a comment below! Coaching last night also reminded me how incredibly technical this sport is. Some people glide through the water with ease and grace, while others splash violently trying to stay afloat. As with all human movement, a major component of your athletic ability is determined by your efficiency, whether it be swimming, running, or the Olympic lifts. But I believe, and I hope this post will show, that efficiency is more important in swimming than in any other sport. Put another way, improvements to technique alone will translate to greater gains in swimming than in any other sport. This is how many master swimmers are still able to set lifetime PR’s well into their 40’s and 50’s. What follows naturally then is a skill based approach to swimming in place of the traditional emphasis on volume. This is demonstrated by your SWOLF score, also known as your swimming GOLF score. To get your score, add the total number of strokes (counting both arms) to do one lap to the total amount of time (in seconds) it takes to complete the lap. For example, 15 strokes and 15 seconds to complete one lap would equal a SWOLF score of 30. The goal is to get this number as low as possible. There are three different ways to do this: 1) Less strokes / Same time. In our example, 13 strokes in 15 seconds, a score of 28. This covers the distance in the same amount of time but with fewer strokes, meaning you are being more efficient per stroke and have a greater stroke length. This is a good thing if you are doing a long open water swim and value efficiency over speed. 2) Same strokes / Less time. Example, 15 strokes in 13 seconds, also a score of 28. Without increasing stroke length or efficiency, the total time is reduced by increasing the stroke rate and therefore your total power output. This can be a good thing if you are in a high school swim meet trying to lower your time, but comes at a much higher energy cost. And finally, 3) Less strokes / Less time. 13 strokes in 13 seconds, a score of 26! You increase stroke efficiency and your total power output at the same time. Your stroke length and stroke rate increase simultaneously. This is ideal and what all swimmers should strive for! Technique and efficiency are developed through practice, while strength and power are developed through training. The SWOLF score shows that optimal swimming is a balance between efficiency (stroke length) and power (stroke rate). But so what? That formula has the same application for all movement and still doesn’t prove why technique is more important in swimming than other sports. What makes swimming unique? The answer is that water is completely different than air. It is very thick and causes a lot of drag. Increasing your speed in water comes at an exponential increase in energy expenditure, while reducing drag is simply a matter of practice and improved technique. That is why you will often hear a swim meet referred to as a contest to see who can slow themselves down the least. Terry Laughlin, founder of Total Immersion swimming, explains this better than I ever could in the Crossfit Journal article Why Swimming Is Different, “Here’s why: The world records for the mile run and the 400-meter swim are virtually identical. If you were to run once around the track with Alan Webb, America’s best miler, he’d beat you easily, but—even if you’re purely a recreational jogger—by running easily and efficiently, you could nearly match the number of strides he took to cover 400 meters. If, on the other hand, you tried to swim 100 meters with American record holder Klete Keller, not only would he beat you easily but—assuming you could complete 100 meters—the difference between his stroke count and yours would be staggering. Keller and other elite freestylers can easily swim 25 yards in 7 or 8 strokes (counting each hand entry as one stroke), while novice swimmers typically average 20 to 25 strokes for the same distance.